Two ingenious Indian brothers, Arun and Anoop George, decided to ditch conventionality and embrace atypicality – On a micro level to power homes with sustainable energy, and on a macro level to achieve their goal of eliminating ‘energy poverty’. Goodbye rooftop solar panels, hello wind power! In their start-up called Avant Garde Innovations, these two brothers have begun working on leveraging wind energy to generate power, resulting in the development of a ceiling-fan-sized, residential wind turbine that they aim to launch in the second quarter of 2017. The turbine is expected to be priced at approximately USD 750. The innovative wind turbine has already won international acclaim. For the Global Cleantech Innovation Programme, it is listed as one of the Top 20 Cleantech Innovations of India. This prestigious programme is organized jointly by the Government of India and the UN Industrial Development Organization, Cleantech Open USA, Global Environment Facility. 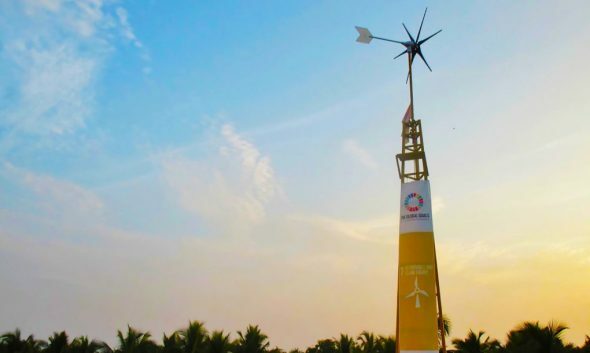 The inventive, environment-loving Indian start-up has also been included by the UN in their USD 1 Billion Clean Energy Investment Opportunity Directory, released at COP21. This apart, in 2016, Avant Garde Innovations also happened to be the only clean energy firm of Indian origin to obtain an invite to Silicon Valley’s 7th Clean Energy Ministerial. Here, the honor of being named as one of the Top 100 Global Startups in Kazakhstan’s NEWENERGY Global Startup Fest was bestowed upon the company.